Arizona Native Status: Introduced. This naturalized ornamental garden plant and groundcover is native to southern Europe. Habitat: Upland, Mountain, Riparian. 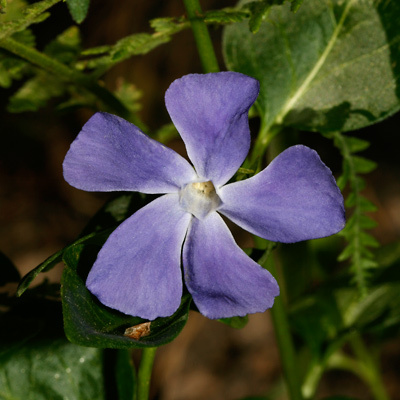 This plant grows in partly shady riparian woodlands in mountain canyons, where it can be quite invasive and smother other plants. Description: The flowers are tubular, up to 2 inches (5 cm) wide, and have 5 curved, blunt-tipped, pinwheel-like lobes and a paler, pentagonal throat. The leaves have finely hairy (ciliate) margins and a truncate, rounded, or heart-shaped leaf base, and are shiny dark green, mostly hairless, opposite, and oval, egg-shaped, or heart-shaped. The longer main stems are prostrate and root at the nodes, while the shorter flowering stems are erect to leaning. 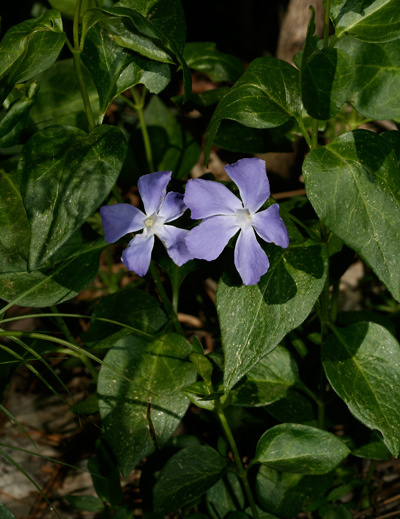 The similar Common Periwinkle (Vinca minor) has smaller flowers and smaller leaves with hairless margins and a narrower leaf base that tapers towards the stem.